The surface parking lot at 47-73 Green St. (left) will soon be home to a new parking deck. The 515-space garage will be about one block over from the Prudential Center. 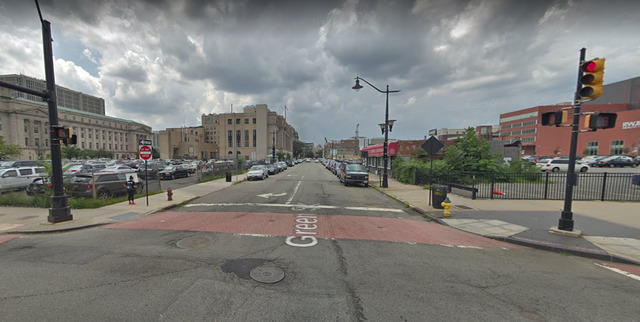 NEWARK, NJ - City council hesitantly entered into a lease agreement last week with the Newark Parking Authority that will push forward the creation of a massive 515-space parking deck near the Prudential arena. The city entered into a redevelopment agreement with the parking authority in 2017. The agreement called for the agency to construct a six-story, mixed-use office building with ground floor retail space and a 515-space parking deck at 47-73 Green St. There property is currently used as a surface parking lot for city employees. City employees during regular Monday-Friday business hours would have access to 258 parking spots in the deck, which is located behind city hall and about a block away from the Prudential Center. The parking garage would then be open to the public for a fee. The parking authority did not respond to a request for comment seeking how much the rates would be for the public, especially during Devils games. The Newark Parking Authority is a public agency that is separate from the city government and manages parking projects. Under the agreement from two years ago, the city sold the lot to the parking authority for $1. The deal that was advanced and adopted on first reading last week allows the city to lease space on the Green Street property for $27 per square foot over a 30-year period. That rate will escalate 5 percent every three years as well, according to the agreement. The city's finance department and the municipal court will use the office space that the parking authority will build. The parking authority will also be utilizing some of the office space on site and there will about 2,200 square feet of first-floor retail space. The agreement has been about 10-years in the making, said Councilman At-Large Carlos Gonzalez. While Gonzalez was one of five yes votes, he had several reservations about the deal at a Jan. 29 council meeting. East Ward Councilman Augusto Amador and North Ward Councilman Anibal Ramos also expressed concerns about the lease agreement. Amador said the deal just didn’t “jive” and was frustrated that the city sold “probably one of the most valuable pieces of land in the City of Newark” for only a dollar. Ramos also questioned whether the city could have built the parking deck itself. The city business administrator, Eric Pennington, told council members that the city's bonding capacity improved ever since negotiations were entered into. Although Pennington hadn’t made an assessment on the deal, he suspected the city could have built the parking deck itself. Pennington also explained that the lease rate is comparable to other rates nearby. Other similar properties go for about $30 per square foot, he said. Cecil Lawrence Crump, general counsel for the Newark Parking Authority, said the city originally didn’t want to burden themselves with the cost of building the garage. Everett Johnson, bond counsel for the Newark Parking Authority, said the agreement ultimately reduces the cost to the city. In 2013, the city and the New Jersey Devils reached an agreement in a years-long legal battle over how revenue would be shared when the team moved to Newark. The Star-Ledger reported at the time that part of the agreement required the city to build a parking deck on Green Street that the Devils could rent, which would generate revenue for the city. Pennington, the city business administrator, explained that the deal with the parking authority also helps the city comply with the terms of the settlement with the Devils, whose home ice rink is at the Prudential Center. “Failure to do so could have a negative impact on us,” Pennington said of building the parking deck. But he also touted the benefits of the parking deck for the city. City spokesman Frank Baraff said the city and the parking authority are in the midst of figuring out where municipal employees will park while the deck is being constructed. The parking authority did not respond to a request for comment seeking the completion date of the deck.